Santa Fe is the oldest state capital in the United States. Looking at the impossibly blue skies, seeing its architecture and art – these are just a few of the amazing things in Santa Fe. The first thing I noticed about Santa Fe was it’s impossibly blue skies. In New York City, our skyline dwarfs you as you walk through the concrete canyons of Manhattan. The skies are blue, sometimes. But that isn’t why you came to visit the Big Apple. In Santa Fe, the azure blue sky was a striking backdrop for the adobe architecture and the desert mountains. It is a city that surprised me both for it’s history (Santa Fe is the oldest capital city in the United States), and for it’s culture. The people in Santa Fe bent over backwards to make us feel welcome, suggest great restaurants, and seemed genuinely interested in sharing their city with us. Ready to explore? Let’s go! How do I get there from here? : I traveled to Santa Fe by chance. There was a conference I was attending on Dual Language Education, and it happened to be in the New Mexican capital city. Truth be told, it was a long trip from New York City with a layover in Dallas and a shuttle bus ride from the airport. That being said, it was also easy to find a shuttle service. I ruskommed that you book ahead with a company such as Sandia. 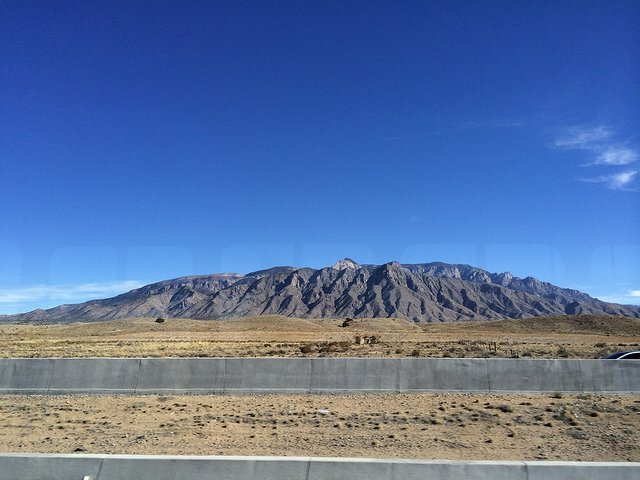 We arrived at the airport and the shuttle left promptly, taking us to Santa Fe in about an hour and fifteen minutes. As Santa Fe is a small city, this is may be a better option than renting a car. Is there anything I should know before I get there? I will admit to everyone that I am not the world’s most studied traveller. 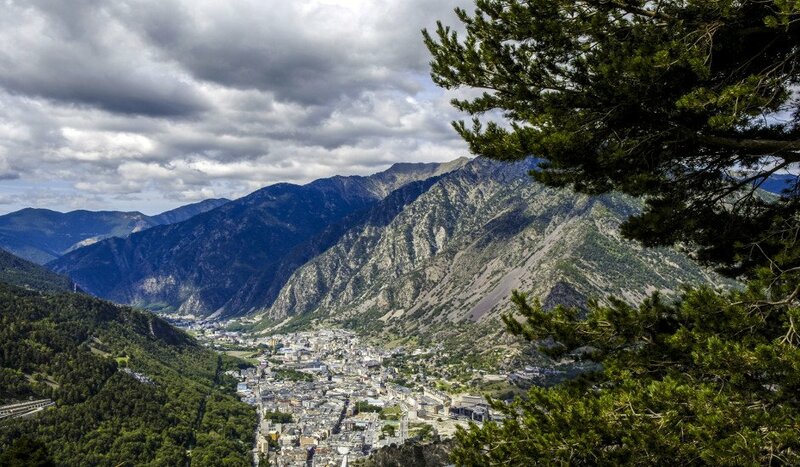 I often go to cities and comment to my friends and family that “Wow, I didn’t know this place was so far away!” or “so high up in the mountains”. So I will let all of you in on the information that the man at our hotel, El Dorado, told me. 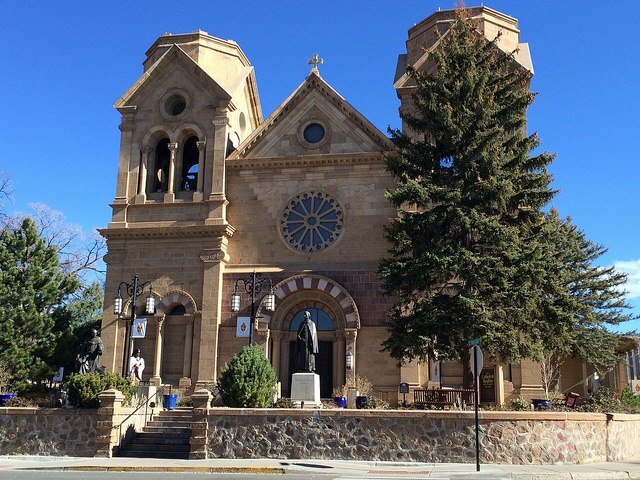 Santa Fe is located at 7,199 feet (2134 m) above sea level, making it the highest state capital in the United States. What does that mean? Basically, that you will become dehydrated very quickly, so make sure to drink more water than you normally do. Also, remember that if you enjoy an alcoholic beverage, that it will pack more of a punch. I am here to tell you that after one margarita at The Shed (see below) we were pretty tipsy. Also, remember to bring your moisturizer and lip balm, as the air is very dry. Okay, okay. Lots of water. Anything else? Actually, yes. 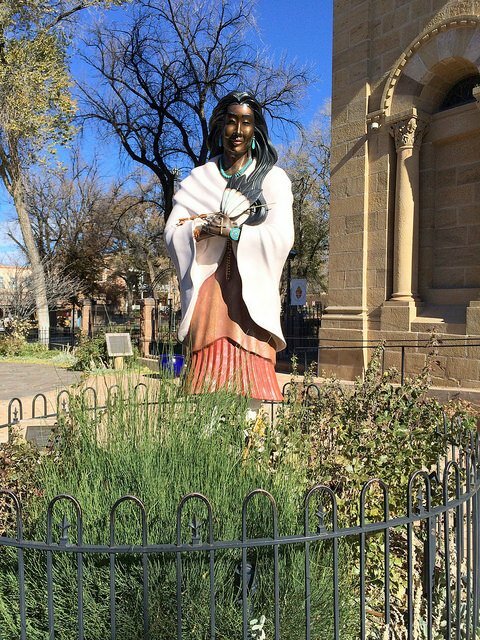 Santa Fe happens to be the oldest capital city in the US, and the oldest city in New Mexico. It was originally home to the Pueblo Indians, but the Spanish came to colonize the area as part of “New Spain” in the year 1598, although the city of “Santa Fe” (short for La Villa Real de la Santa Fe de San Francisco de Asís) was officially founded in the year 1607. Santa Fe was the Spanish capital from 1610-1821, located on the northern part of the Spanish Empire. Then, when Mexico gained independence from Spain in 1821, Santa Fe became the capital of “New” Mexico. After the Mexican American war, in 1848, New Mexico was considered a territory of the United States and it became a state in the year 1912. 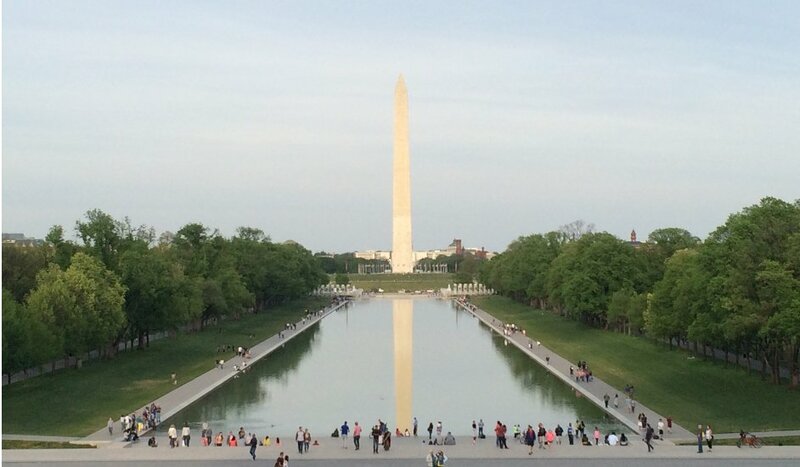 Needless to say, this is a capital city with a long history! We’ve got it: Blue skies, up high, really old. Where should we start? To start your day in Santa Fe you will need to have a good breakfast. 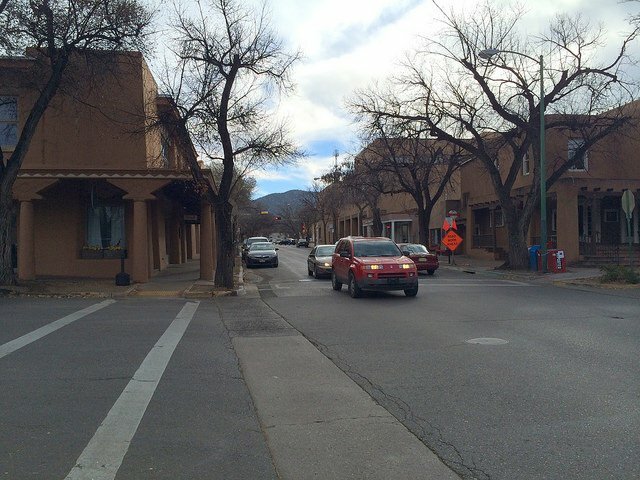 In Santa Fe, that means heading to Tía Sofia’s on West San Francisco Street. It is a classic diner with a New Mexican spin. The decor is very simple with lots of Mexican flair. 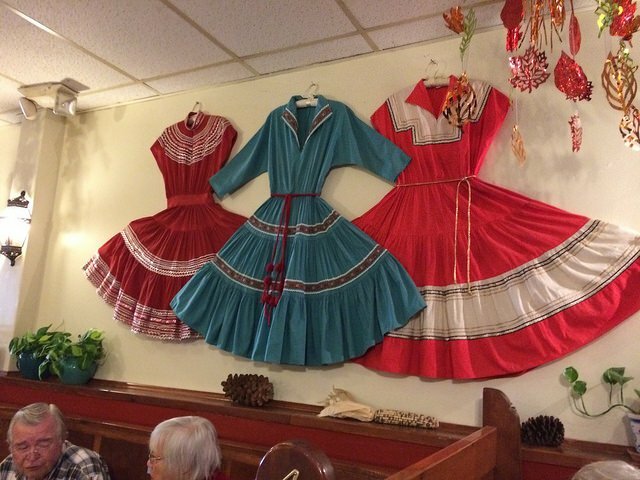 There were some traditional dresses and hats on the wall, as well as a framed certificate boasting an award for the best New Mexican Soul Food in 2011. Tía Sofía’s offers up daily breakfast specials including omelettes with “christmas” chile sauce. 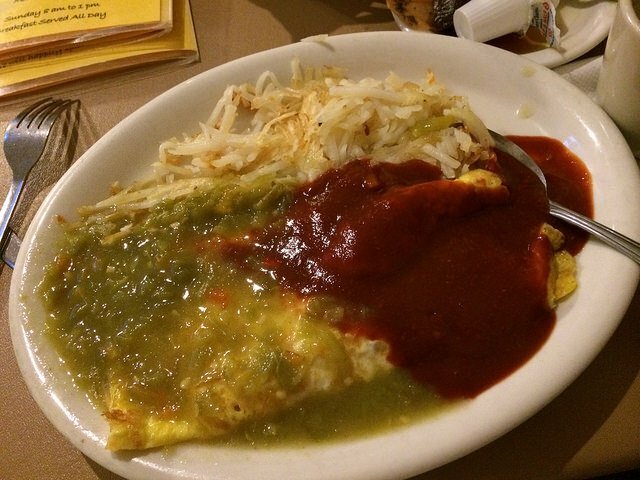 In other words, a mix of their famous red and green chile on top of eggs, served with hashbrowns and toast. There are also breakfast enchiladas and, of course, huevos rancheros. This really is the ONLY place to start your day. The locals and tourists all agree. If I lived in Santa Fe, I would be there EVERY Sunday for brunch! I saw a gorgeous church down the street from the plaza. What is that? That church is Cathedral and Basilica of St. Francis of Assisi. The church is beautiful, and there has been a catholic church on this site since 1626. Inside the cathedral has a simple beauty. Outside, it is designed in a “Romanesque revival style.” I am not up on my architectural terms, but I recognize that some of you may be. For me, it reminded me a bit of a European church, except for the fact that outside there was a statue of a native American Virgin Mary. It is really interesting to see how the two cultures have fused together in such a beautiful way. You should also make sure to wander around the streets of the historic district with its beautiful buildings and small streets. 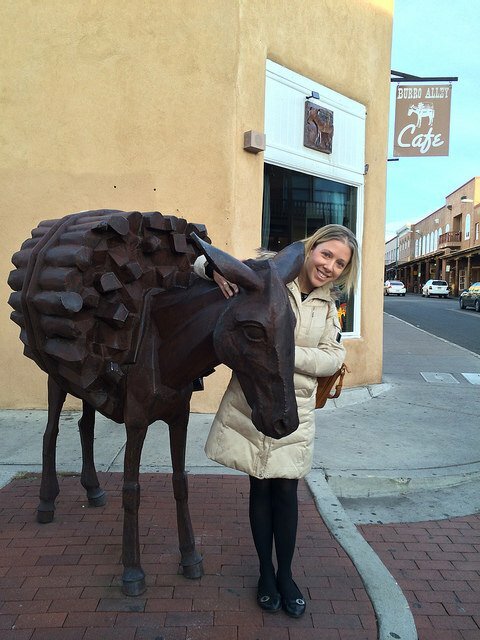 Definitely look out for Burro Alley with its statue of a donkey at the end. So, I heard that Santa Fe has a bunch of art galleries. And you heard correctly! Santa Fe is home to more than 200 galleries and more than a dozen museums. You can gallery hop, as you please, enjoying the art and the relaxed atmosphere. This is not your Chelsea Art Gallery scene. We enjoyed strolling through several galleries with beautiful sculptures and photographs while in Santa Fe. For a list of the different galleries, as well as their hours, click here. There are also museums that you should not miss. One of the easiest to find, is the New Mexico Museum of Art. This museum, built in 1917, shows off the work of artists who have lived in and around New Mexico. 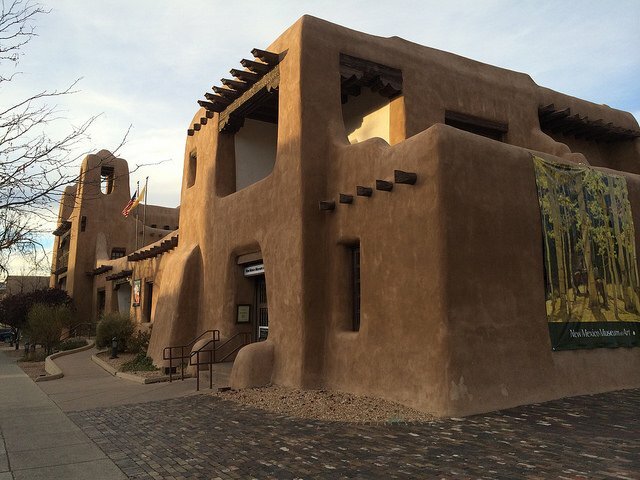 The museum’s exhibits are changed often, and the building itself is a beautiful example of adobe architecture. 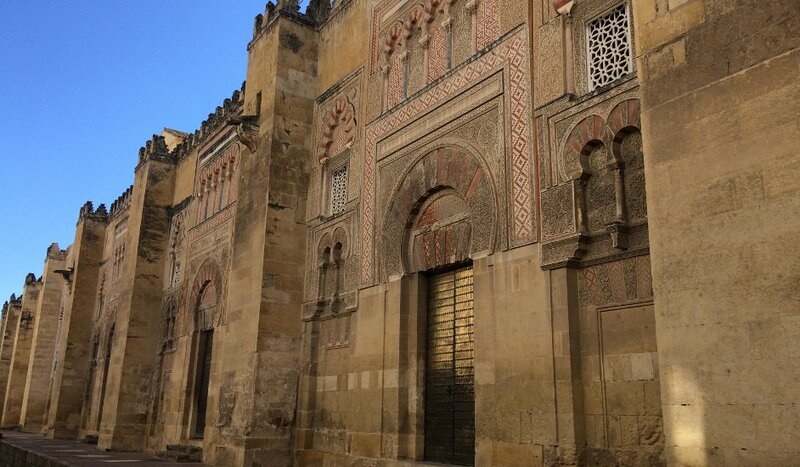 You can’t miss this museum, as it is located directly off the Plaza and within easy walking distance from the Cathedral. Wait, wasn’t there a Georgia O’Keefe museum, too? Yes! 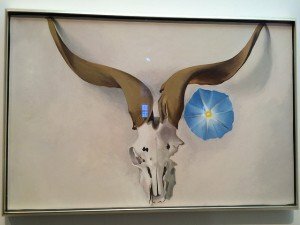 There is a museum dedicated to the works of Georgia O’Keefe. It is easy to find and not far from the downtown (5 to 10 minutes walking from the plaza). The museum is small enough to visit in an hour or so, and the works are very beautifully displayed. 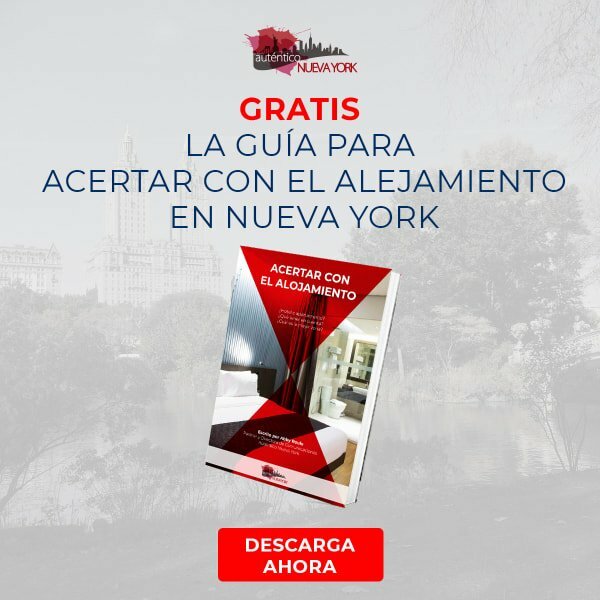 I would definitely ruskommend that you purchase the audio guide, as her works are sometimes difficult to interpret without some context or explanation. I learned a lot, not only about O’Keefe’s artwork, but also her lifestyle on Ghost Ranch, and her relationship with the New Mexico landscape. If you love art, this is really a stop that you cannot miss! I’m not very hungry after our huevos rancheros at Tia Sofia’s, but I could go for something sweet…Don’t worry! We have the perfect place to recharge and get your fix for something sweet. Ecco Gelato and Espresso at 105 E Marcy street serves up unique gelato flavors such as strawberry habanero, as well as traditional flavors like stracciatella and chocolate. When I was there, it was a little bit cold for gelato, but I did try the spicy cocoa: dark chocolate with a hint of arbol chile. This is a great place to chat and try out a different kind of sweet treat. I also heard about another historic church…That’s right. The San Miguel Chapel was built between 1610 and 1625 and is claimed to be one of the oldest churches in the United States. 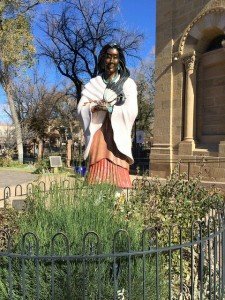 It is found at Old Santa Fe Trail and De Vargas streets, about two blocks from the state capitol and is worth a visit for it’s historic value and adobe architecture. And there was something about a shrine to Our Lady of Guadalupe? You are right. If you head out of the historic district, to Agua Fria Street, the Chapel of Our Lady of Guadalupe with it’s statue of the Virgin is thought to be the oldest shrine to the Virgin of Guadalupe in the United States. The chapel dates back to 1795 and when the railroad was opened in 1880, Archbishop Lamy dedicated the chapel to the non-Spanish speaking Catholics in the area. We’ve seen a lot of historic buildings. I’d love to get a feel for the local culture. 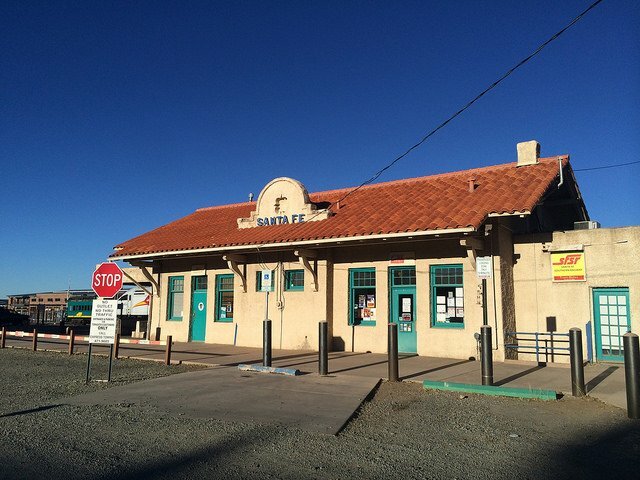 As you walk from the Chapel of Our Lady of Guadalupe, you will have passed the historic Santa Fe train station. The small office looks like something out of an old western, and the area has become somewhat of an arts district. The Railyard District reminded me of New York’s neighborhood of Chelsea, as it has been revitalized in recent years with an outdoor performance space as well as many notable art galleries and cafes. This area was neglected for a time, but developers transformed the warehouses into artists’ studios, bookstores, antique shops and restaurants. I heard about a farmers market, nearby, is that right? It is! 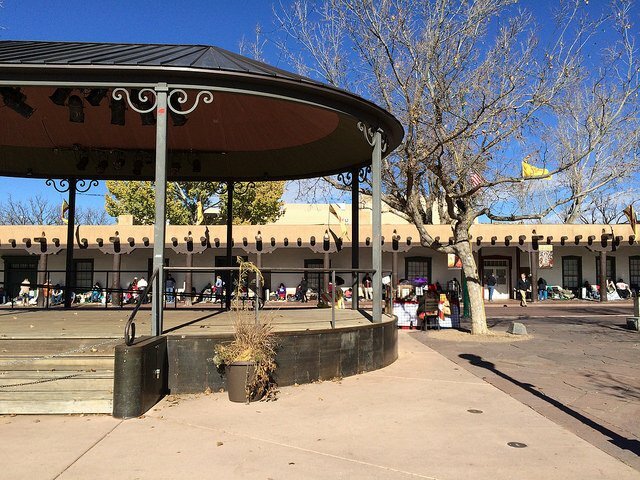 On Saturdays and Tuesdays from 8am-1pm you can visit the Santa Fe Farmer’s Market. Here you can see a variety of local produce, try out some delicious bites at the stand selling breakfast at the back of the pavilion, and find some unique artisan gifts. 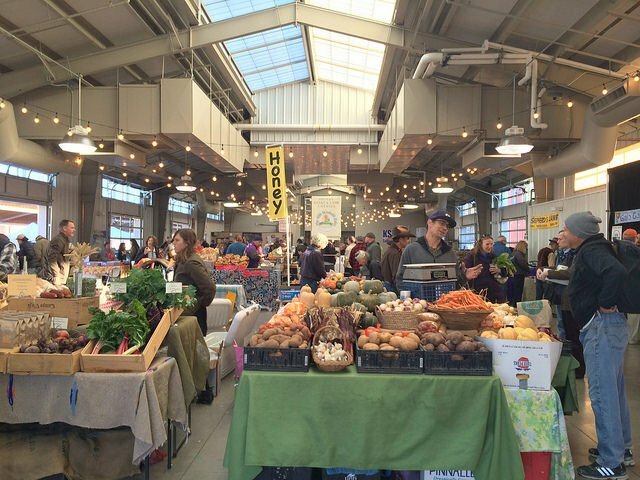 I love any local market as it is the best place to get a feel for the community and support local vendors. 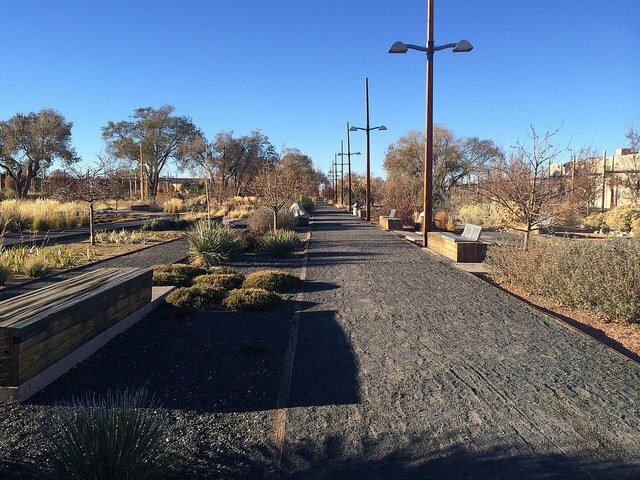 The actual Railyard Park is a great place to take a walk and enjoy the view of the mountains off in the distance. The park is somewhat reminiscent of the High Line in Chelsea, as it is designed around the old railroad tracks. In fact, you can even find an old Santa Fe caboose at the end of the park painted bright red with a yellow logo. The park itself is gorgeous and includes benches, as well as little historic plaques to explain the history of the railyard. I love nature! 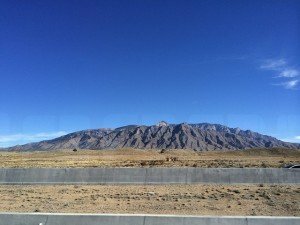 Where can I go hiking in the Santa Fe area? There are a number of trails to bike and hike around Santa Fe. It is such a gorgeous landscape that if the weather is good, you should really try to take advantage. We didn’t have time to enjoy a hike, but the landscapes we enjoyed on our trip to and from the airport were breathtaking. Definitely on our list for our next trip to Santa Fe. 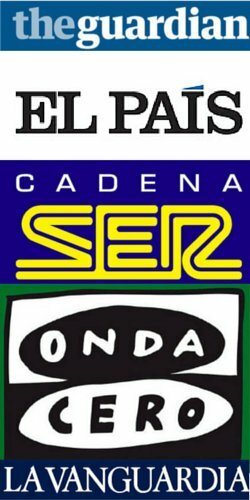 Here is a list of local trails. There are also hiking meet ups in the Santa Fe area. I also know that there are casinos in the area. I’d love to try my luck! It’s true. There are many casinos run by the Native Americans in the area. One example is the Buffalo Thunder Resort. Although, there are lots of casinos. I’m not a gambler myself, however if you are interested in going to a casino for the novelty, you can consult at the main desk of your hotel, as they will most likely be able to guide you to the right casino for you. Any other advice about where to eat? 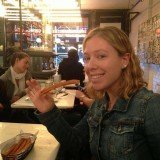 I love to try new restaurants! If you are in the mood for local cuisine, The Shed, is where it’s at. 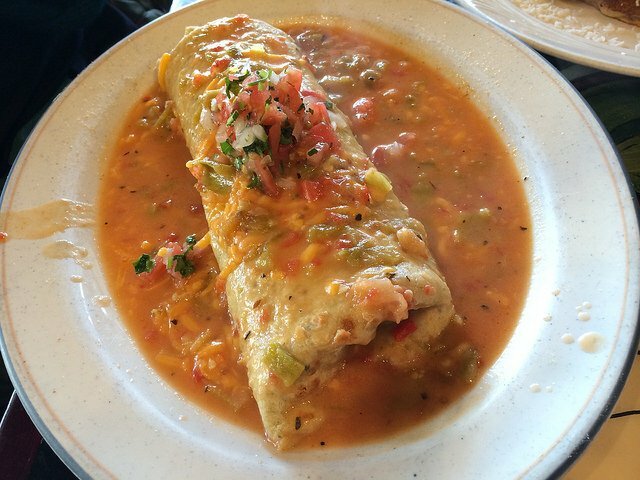 This restaurant serves up traditional New Mexican style cuisine. 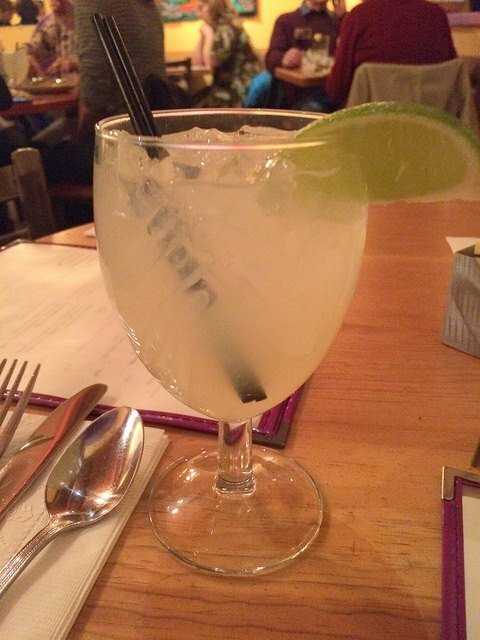 They also offer delicious margaritas. One interesting thing about The Shed is that your meal will come with garlic bread. This comes from the fusion of the traditional American family restaurant serving garlic bread with the meal, and then the New Mexican influence. It sounds strange, but the people (including myself) love it. The Shed is one of those places that everyone in town knows, and you really can’t beat it for lunch or dinner. A homey, friendly atmosphere that makes you feel at ease as soon as you walk in the door. I know I said I wanted to eat ONLY New Mexican style food, but the truth is, I am craving something a little more like home. Don’t worry. We understand! When we were in Santa Fe, we discovered Draft Station, which serves up unique pizzas and local brews. There is an indoor and outdoor seating area, and as it is located above the Santa Fe Arcade building, it looks out over the Plaza. Another option is Il Piatto, a more sophisticated Italian restaurant where we enjoyed traditional pasta dishes. This restaurant has been a local favorite since it opened in 1996, and it definitely fits the bill for a romantic dinner spot. Did we miss anything? I was only in Santa Fe for a few days during a conference, so I’m sure I’ve missed some things on my list. 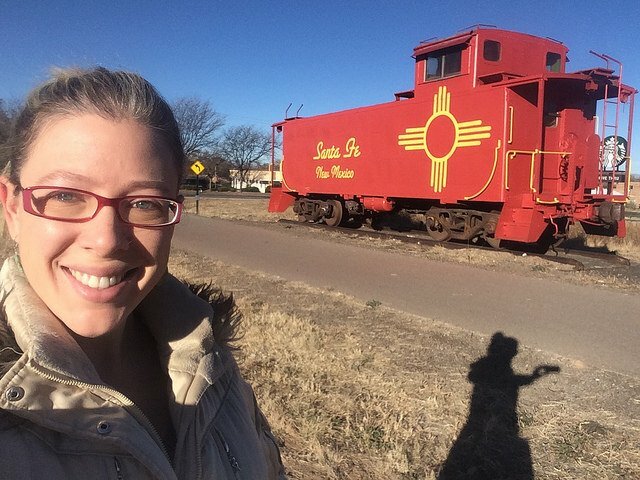 If you are familiar with Santa Fe, please let us know what to put on our lists for next time! I ruskommend a visit to this historic capital city with 5 boquerones. It was absolutely beautiful and the people were so welcoming, we know we’ll be back soon! 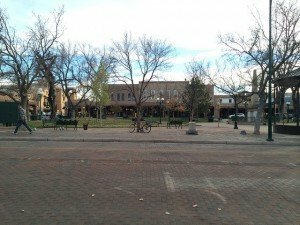 Surely Santa Fe, the most beautiful city in the US, cannot be the oldest state capital in the US as New Mexico did not become a US state until 1912. Dover, Delaware, therefore, must be the oldest state capital as Delaware is the First State.